We are a leading Manufacturer of pattern changer valve from Mumbai, India. Being leaders in the market, we are manufacturing an excellent range of Pattern Changer Valve /Spool Valve that is hand operated and has 4 inlet ports and 4 outlet ports. 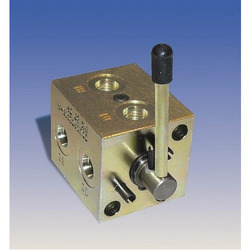 These spool valves are designed to switch joystick functionality on equipment such as excavators. Our spool valves are precisely tested on several parameters by quality controllers, in order to ensure delivery of a perfect range. Offered spool valves are available from us in diverse specifications to choose from. Looking for Pattern Changer Valves ?